A new poster for the second part of Fear The Walking Dead's fourth season has arrived and the future continues to look bleak for (ex?) lead protagonist, Madison Clark. 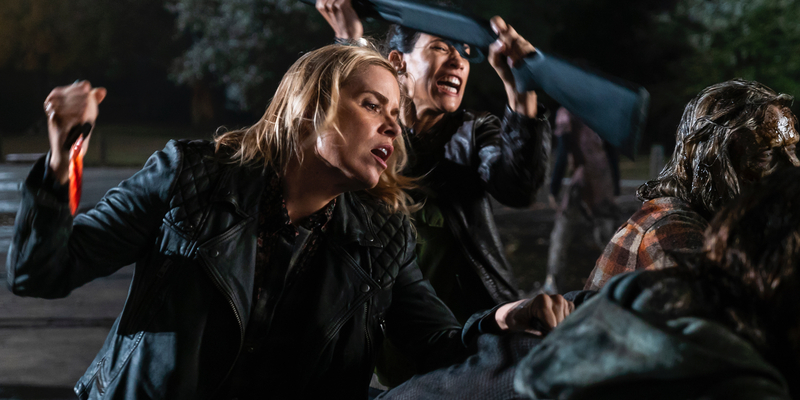 FTWD shook its formula up massively in its most recent run, introducing a host of new main characters and drafting in Morgan Jones, the stick-wielding on-off pacifist from The Walking Dead. Shockingly, FTWD also killed off one of its main characters in the form of Nick Clark, who was shot by a child at point-blank range and left to die in front of both his friends and family and the viewing audience. While Nick's death was as definitive as could be, another character's supposed demise is still up for debate. The first half of FTWD season 4 was split into a present narrative and a flashback narrative and with Madison only appearing in the latter, viewers began to worry that the character had died. In the mid-season finale, Alicia, Strand and Luciana revealed that Madison had sacrificed herself in an attempt to save the rest of her people, drawing an attacking zombie horde into their baseball stadium community and locking herself inside with the undead masses. Given the nature of Madison's desperate actions however, not only did the other members of the group not actually see her die, but the audience didn't either and this has lead to speculation that the character will re-emerge further down the line. As a result, AMC's latest poster for the continuation of FTWD season 4 (via Seenit) is noticeably Madison-free. The poster - which, oddly enough, bears a passing resemblance to one of the promo posters for Sharknado 5 - features all of the primary cast in their best action poses, with Morgan positioned at the fore underneath the tagline "No Calm After The Storm." Some might suggest that Madison's absence from the poster is more evidence that the character is truly dead. After all, actress Kim Dickens did post a farewell message on her Instagram page to seemingly confirm her exit. Despite this, there remains a strong possibility that Madison is still alive and that AMC and FTWD are attempting to playfully mislead viewers. There is an iron-clad rule in television - and particularly with shows of this ilk - that unless the audience sees a death happen on-screen, the character in question is still alive. Given that Madison was only seen locking herself inside the flaming, zombie-filled stadium, her survival skills could yet save her skin. Interestingly, it's also possible that the trauma Madison would surely have faced getting out of such a dire situation could trigger her transformation into Alpha, a villain from The Walking Dead that many fans believe Madison could eventually become. Another element of the poster worthy of note is the prominent CR-91 sign. Of course, there could be a wide variety of interpretations as to the significance of this road sign but it could perhaps be a potential clue (for those with a solid knowledge of U.S. road geography anyway) as to where the remaining survivors could be headed in FTWD season 4B. Fear The Walking Dead season 4 continues August 12th on AMC.